Today, as many of you know, I am 40. My parents find this nearly impossible, as they too are 40. I know for some, hitting a milestone like this is more bitter than sweet, the official beginning of Middle Age. But for me, I take great pleasure in hitting the big 4-0. First of all, it means presents and cake. How on earth could that be bad? Second, I am smart enough to know how blessed I am, and I have truly never been happier, never been in a better place, never been more delighted to be me as I am right now. I think 40 is a perfect age for me. I’m old enough to know better, and still young enough to sometimes pretend not to know better. I’m still young enough to be out till 2am when the mood strikes, but old enough to take myself home to bed at eleven without being at all concerned that I will “miss something”. I’m old enough to have longtime friends with decades of memories, and young enough to take joy in finding new ones. And I’m old enough to know that you have to ask for what you need or you don’t have the right to be disappointed if you don’t get it. 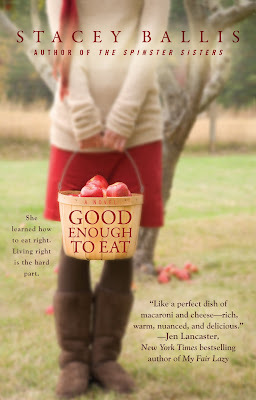 My new book, Good Enough to Eat , is coming out September 7. It is a book about a chef in Chicago who is also 40, who has her life turned upside down when, after struggling for two years to lose half her body weight, her husband up and leaves her for a woman twice her size! I am very proud of it, and I think you and yours will enjoy it. There is even a mini cookbook of recipes in the back! The book is officially available for pre-order on Amazon. Here is what pre-ordering does for me…the more people that pre-order the bigger the buzz. Amazon’s computer server will start thinking that this is going to be a big book and it will get moved up in the roster of pop-ups and suggested reading hints. My publisher will see the pre-order numbers and think it is going to be a big book and will do a larger print-run. The sales force will see the larger print run and know that they will have to push the book harder with the bookstores, who will order more copies, and the more copies they order the better the in-store displays, and the better the displays the better sales and the better sales the happier Stacey is to be 40! Plus it helps with the whole “I’d really like to get another contract write another book for you people to read.” thing. So, in honor of my birthday, I am asking you to click the link below and order your copies! (Note, I did say copies, plural. I’m 40, people, let’s think in multiples, shall we?) Send a note or forward this one to everyone you ever met, even the people you don’t like very much, and encourage them to order copies. Put it on your book club’s calendar for the Fall, and get them to order their copies. Post it on your Facebook, write about it on your blog, Tweet to your heart’s content! My personal goal is to get to #40 on Amazon in honor of turning 40. So check the numbers periodically during the day, and if I’m not there, well then, order more! Tweet louder! It’s Tuesday, people are bored at work and the weekend is a million miles off, so get your whole office in on the game. I adore you all and thank you in advance for your support, your well-wishes, and for being a part of making my life so wonderful. Now let’s go out there and get me to #40!!!!! YAY! *So* excited for the new book and your big milestone :) CONGRATS! WOO-HOO! New Book! Cannot wait and it sounds wonderful...right up my alley since I am a 40YO home chef. And 40 is great...I am about to celebrate the big 4-1 next week and will miss my first year as a 40-something. Happy Birthday! I wish I was 40 again! I love your reasons why it's a good place...mind if I use them? Happy 40 girl! I totally agree with your sentiments about hitting 40. I believe you are only as old as you feel, and most of the time I feel quite a bit younger (except when my body tells me otherwise).